Question: What is halfway between the book-sharing Little Free Libraries that are sweeping the country and your town library? 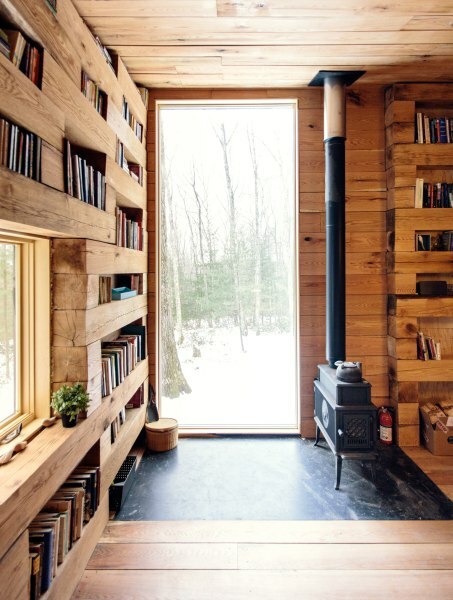 Answer: A personal library set apart from your home in a tiny house. The Today show interviewed an artist whose friends helped him build one, perhaps also securing themselves a place to stay as a guest. Christina Poletto reports, “In New York’s Ulster County, at the base of the Catskills Mountains, Jason Koxvold’s woodland home has a new addition to the property that is nothing short of stunning. There, tucked among the property’s forest of oak trees, sits a tiny one-room library which holds 2,500 books. “Koxvold, a British artist based in New York, owns the property and was inspired to carve out a space specifically for solitude and escape. ‘I work from this location and was looking to make a quiet space for writing and reflection,’ Koxvold told TODAY. “Koxvold desired a simple, singular structure that he could construct on his own using red oak from the property. “Using already-felled trees left over from the construction of the main house, cut trees were planed on site into large log sections measuring 8 x 8 feet. After air drying the 12,000 lbs of milled red oak for several seasons, they became the shelving and cubbies that make up the the library’s interior. “Koxvold was able to complete this structure with the help of eight different friends over the course of a year. “If you’re lucky enough to be invited as a guest, you’re welcome to leave a private message in one of the books on the shelves.” More. Nice idea about leaving notes. In Suzanne and Erik’s Harlem apartment, an entire wall was available for written messages. Guests loved it. How delightful to sit in there reading a book. I like the note idea too. I hope the collection is worth reading. What a perfect little space–I want one! It’s a private place, like a tree house or a backyard playhouse, a place to get away, where maybe the world can’t follow.